The Netgear Orbi AC3000 Tri-Band Wi-Fi system is a godsend for larger homes who suffer with Wi-Fi dead zones. The router and satellite devices can cover a space of up to 5,000 sq. ft. The system supports a top speed of up to 100 Mbps, allowing you to unleash the full power of your high-speed internet connection. This is particularly good news for gamers, or Netflix addicts who want to stream in 4K. The Orbi is compatible with Alexa and the Google Assistant - you can even ask these voice-assistants to reboot the system if you're experiencing network difficulties. What we love about Netgear Orbi's Wi-Fi systems is the technology that they use to make your network as fast as possible. The tri-band' in this Wi-Fi set is a separate connection that your router and satellite use to connect with each other. This means that connection on your satellite is just as fast as the connection on your main router. The system also automatically switches you between the 2.4 GHz and the 5 GHz bands, giving you the quickest connection available. In contrast to conventional repeaters, your dual device system will be conveniently available under a single Wi-Fi network name. Parental controls: The separate Netgear Genie allows you to set up advanced parental controls on your home network. You can choose from default settings or create custom controls. You can also make separate accounts for adults to circumvent the controls. See your connection: Situated on top of both the router and the satellite is a LED that lights up in certain colors depending on the strength of the connection. This allows you to physically see where you need to place the device, allowing you to get the quickest connection possible. A single network name: Traditional repeaters require you to disconnect and reconnect to two separate networks depending on which side of the home you're in. Netgear Orbi gives you a single Wi-Fi network to connect to, making surfing throughout your entire home all the more convenient. Disney Circle: Netgear has paired together with Disney to create a second pair of parental controls for your Orbi network. The basic package lets you view browsing history from your kid’s devices as well as pause access on certain devices, while the premium subscription package allows you to set time limits, bedtimes and even reward your kids for good behavior. Heat sink: Both router and satellite make use of fan-less cooling technology. This allows them to deliver stable performance at higher network speeds while keeping them quiet. Guest networks: You can set up a separate network for friends and family when they visit. This allows you to keep your Wi-Fi password secret, while also reducing the amount of overall traffic on your main network. You can even use Alexa and Google to enable and disable the guest network. 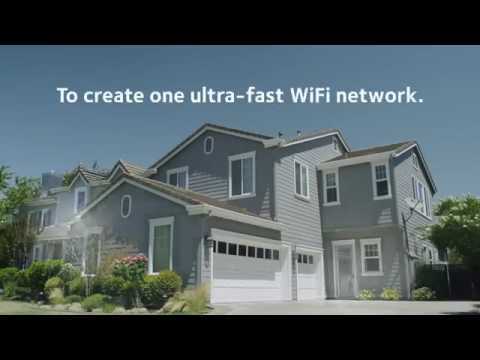 What makes Orbi Wi-Fi different from traditional repeater systems? The most important difference is the tri-band (a 5GHz band with a maximum speed of 1,733 Mbps). This is a band dedicated purely to any communication that takes place between the satellite and router. A traditional repeater does not have this dedicated channel, which usually means that connection speeds are far slower on the repeater device. With the Orbi AC3000, you should get similar speeds on both the router and satellite. Another difference is that the Orbi system has a single network name. If you simply buy an add-on repeater device for your existing router, you usually have to set up a second network in your home under a different name. This means that you will always be switching between both networks as you move through your home, which can lead to interruptions when you stream and surf. The Orbi system gives you a brand-new router in addition to a repeater, eliminating the need for multiple network names. On a technical note, the Orbi system doesn't require line-of-sight placement. A traditional repeater typically needs to be placed within 'looking distance' of your router. By contrast, you can place the satellite device much further away from the router and still get a strong connection (between 30 and 70 feet away). What effects Wi-Fi performance in the home? More and more devices these days depend on an internet connection to function. The Orbi App allows you to see which devices are currently connected to your network and disable them for a certain time. This is an ideal solution if you're looking to get a more stable connection for a particular activity (e.g. a conference call or 4K streaming). Setting up a router can often be a tedious process. By creating an Orbi app, Netgear has made setting up their tri-band as simple as can be. It's a matter of plugging it in and following the instructions in the app. The router has six internal antennas, which help the system to squeeze every last bit of bandwidth from both the 2.4 and 5 GHz channels. The tri-band channels help router and satellite to communicate quickly with each other. You have the option to use both the web and the mobile app if you wish. Its layout uses a series of square main menus, which open up into sub-menus when tapped or clicked. Comes with advanced parental controls, the ability to block devices from using the network, switches devices between channels, and gives you an overview of devices connected to the network. Limited functionality with Amazon Alexa and Google Assistant. The LEDs on both devices let you see first-hand whether your devices are placed correctly. You'll get a solid connection in a range of 5000 sq. ft., with speeds remaining impressively quickly even at the outer edge of this area. Netgear has done a good job making the router and satellite look distinct from one and other, while not having them look so different as no longer feel connected. The three color LED light on top of both devices doesn't create a disturbance. No different from other Wi-Fi networks - a strong password is your best protection when it comes to keeping your data secure. The ability to set up a guest network helps to keep this password safe. On the higher end of the price scale, but 100% worth it for larger homes which are struggling with poor connection quality. It's parental control and device pauses are worth it for families who struggle during homework time and bedtime. What should I do if my Orbi router can't find my Orbi satellite? If the LED on your Satellite is lighting up magenta, this means that your satellite is unable to connect to the router. To resolve this, try the following: The first thing you should try is to simply move the router closer to the satellite. This should fix this problem in the vast majority of cases. If you're still having this problem, try syncing the devices with each other. To do so, simply press the 'Sync' buttons on the back of both satellite and router. Can I simply use an Orbi satellite device with my existing router? In order for the Orbi system to function properly, you must use the router and satellite device together. How far should I place my Orbi satellite from my Orbi router? It's recommended that you place the satellite a minimum of 30 feet and a maximum of 70 feet away from the router.